This unissued SS Cuff Title is in mint condition. It is very fine example, with textured black cloth and seven bullion stitches on each edge. In the center is an extremely finely woven "3"; the workmanship is incredible. On both ends of the reverse is a paper SS tag. The first tag is stamped "373" and has a run number of "325988". The second tag is stamped "149" and a run number of "460243". I do not know why there would be two issue tags on one title but they look original to the piece and are in mint condition. 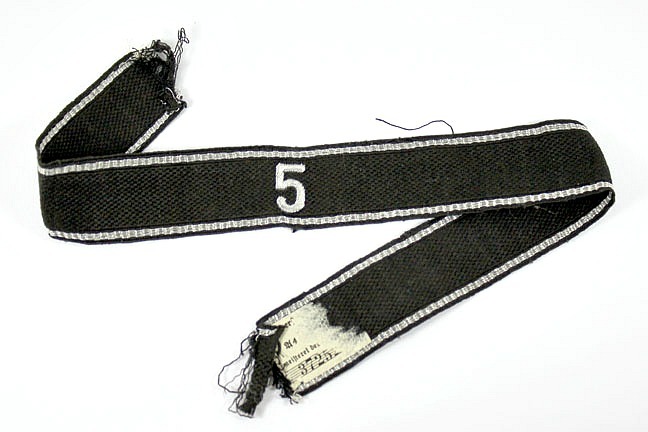 It is interesting to note the reverse material behind the "3" there is an applied cloth buffer, presumably to protect the fine weaving. An outstanding, original SS Cuff Title here. This Africa Korps Cuff Title looks to have been cut from a uniform. It seem to be all there, although the ends are a bit tattered. It is constructed of soft, textured brown wool piped in white cord. It reads "Afrika" in woven lettering, flanked by a pair of nicely woven palm trees. A good Afrika Korps piece here; these are very uncommon these days. This cuff title is extremely impressive looking. It is full length and constructed from a stiff black wool-like material. It is trimmed with twin bullion cords on the edges. In the center, in Sütterlin script, are the words "Hitler Jugend". The bullion lettering is extremely tight and fine. I had this cuff title expertly vetted and it is indeed a genuine example. This is a very rare item and a grand opportunity to acquire an original. This SS Cuff Title has been vetted as original and authentic. The reverse of the cuff title has cleanly cut ends. There are no RZM tags on this piece. A very fine example here, rarely seen and a perfect addition to an SS collection. This SS Cuff Title is a nice original, still in uncut condition. It is the normal seven wire stitches on each edge, and is a fine, black woven item. The standarte of the original wearer is tightly woven into the title in vaulted aluminum bullion, “5”. The reverse of the title has the remnants of the original RZM tag. About half of the tag remains, and the original portion with the run number “3725” can still be seen. A good, original cuff title that would look great displayed next to a nice early dagger.